A nice mention from Ben of The Sword Interval, thought was also worth linking! And general reminder that I upload pages at stupid times, especially lately, but the RSS and email list will notify you immediately if you care about such things! Otherwise I post updates to Twitter/ FB in the morning and evening PST. Huh, how strangely welcoming, yet disconcerting. The second panel is pure Science Fiction. The unearthy light. The strange, obviously constructed area crisscrossed with irreal lines, contrasting hard with the arcane slopes. Just wow! I think this really is the first sign we’ve seen of something unnaturally structured in Mare Internum. The only other thing I remember are some markings on a rock when Mike was looking for his reflection. P.S. I wonder if those steps are spaced for Walla. I guess anything Bex is about to run into will somehow be designed for their convenience rather than Humans. Judging from the second panel it looks like she could climb them just fine, more or less. In defense of Kalla, she can’t understamd Levi’s speech so couldn’t add to the directions. Hahaha, “there are stairs ?”, I think I would not have put it quite as mildly as she did. Those darn GPS units, always giving you the “technically shortest” path instead of the easiest path. What’s she bitching about, there’s a convenient slip-n-slide water chute right down those stairs! Don’t be too hard on Levi. He’s never had human legs or arms. I’m confused. Where are you supposed to type in “sudo make me a sandwich”…? Those lunar lava tubes are freaking HUGE! I love it. Thanks for sharing, that will slightly improve my sci-fi writing. My first thought was “the stairs lead nowhere in particular” because the processor is really that pool in the middle of the canals . . . turn around, Bex. Why do I get the feeling that she’ll be descending those stairs in the end? She’s not going home. wow… I guess Levi really didn’t like her. So what’s everyone think the processor is going to look like? Some installation in a chamber, a mobile being of some sort? Please help… I am so confused. For me the stairs look like they go up in the second panel, down in the third panel, and up again in the last panel. Two sets of stairs. One in the amphitheater shape that Bex just climbed up, and one MASSIVE one that’s a straight shot going up and to the left. Correct. There are two sets of stairs, and Bex is at a sort of midpoint. My biologist heart frolics at the sight of this, I feel like I’m in an Arthur-C-Clarke-novel! This is the first really non-natural formation that we get to see inside Mars, isn’t it? It is a secondary formation, carved from existing structures, with not only function but with aesthetics in Mind. These streams of enhanced water are a very elegant way of distributing information down-stream (literally), with further distribution through the artificial ecosystem. But it is, of course unidirectional, not a cycle. I wonder how the processor receives information back from the terminal units in the cave? You have to think long term here. Most likely the system uses the natural hydrologic cycle plus unseen pumps to bring imprinted water back to the processor at the top. It’s space alien technology so who knows, but I would guess the system that lasts that long can work with a return cycle of a few months to years. Whatever is in the ‘water’ (nanoparticles?) seem to also update wirelessly, so strictly speaking there doesn’t need to be a return cycle for data, but probably just to reuse the raw materials. This webcomic gets under my skin like no other. It makes me feel extremely uneasy but in a very good way, does that make sense ? I can’t wait for you to post more. 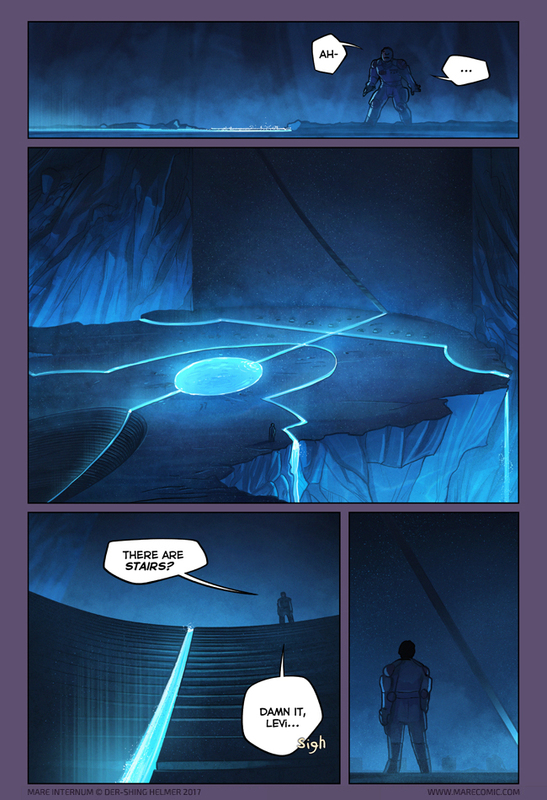 The 2nd panel, those lines, I’m not too sure if I see a Psi symbol or an Omega symbol on the floor? depends which way up you are looking at it.. This is where she starts channeling Boston Low. If the set of stairs to Bex’s right are hanging in mid-air, that’s probably the single greatest piece of engineering in the entire cavern.